In the last two decades, the significant market demands for microalloyed steels have led to enormous efforts as regards the optimization of their properties. Following a national research program, the present work was scheduled to deal with a special grade of V-microalloyed steel. This grade was examined after a series of successive isothermal heat treatment to produce a variety of phase combinations (e.g., ferritic-martensitic, ferritic-martensitic-bainitic and ferritic-bainitic microstructures). Tensile and impact tests were performed to gain knowledge about the mechanical properties. The resulting microstructures were evaluated by means of SEM and optical microscopy. 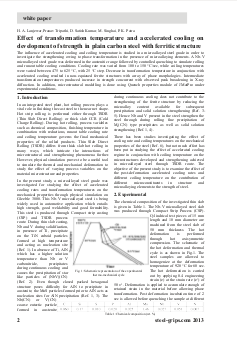 The results indicated that the corresponding tensile behaviour of the steels was strongly affected by microstructure and heat treatment parameters. 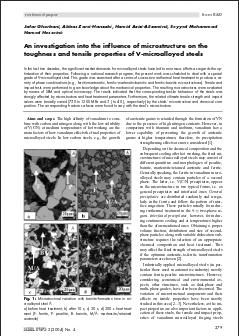 Furthermore, the related ultimate tensile strength and impact values were broadly varied (750 to 1200 MPa and 5 J to 40 J, respectively) by the steels´ microstructure and chemical composition. The corresponding fracture surfaces were found to vary with the steel´s microstructure. 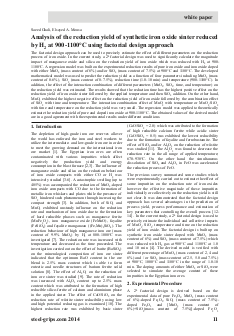 The influence of accelerated cooling and coiling temperature is studied in a microalloyed steel grade in order to investigate the strengthening owing to phase transformation in the presence of microalloying elements. A Nb-V microalloyed steel grade was deformed in the austenitic range followed by controlled quenching to simulate rolling and runout table cooling conditions. Cooling rate was varied from 100 to 150 °C/sec, while coiling temperatures were varied between 475 to 625 °C, with 25 °C step. Decrease in transformation temperature in conjunction with accelerated cooling resulted in non-equiaxed ferrite structures with array of phase morphologies. Intermediate transformation temperatures produced increase in strength concurrent with observed peak broadening in X-ray diffraction. 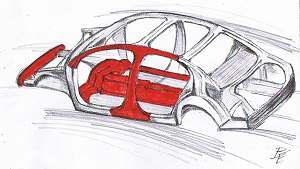 In addition, microstructural modelling is done using Quench properties module of JMatPro under experimental conditions.